Given by the Duke of Norfolk, in conjunction with The Norfolk House (St. James's Square) Syndicate Ltd. This panelling and ceiling came from the Music Room of Norfolk House, the London town house of the Dukes of Norfolk (demolished in 1938). 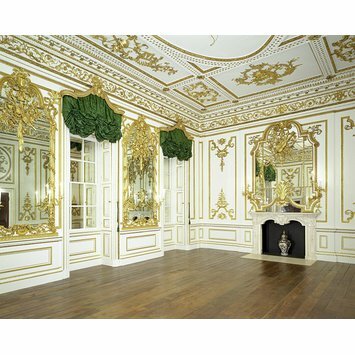 The Music Room formed part of a circuit of state rooms on the first floor, which included three drawing rooms and a state bedchamber. The ceiling panels are decorated with trophies representing the Arts, and the larger wall panels with musical trophies, surmounted by heads of Apollo, the ancient Greek god of music. The smaller panels on the ceiling represent the Arts: Painting, Sculpture, Architecture (represented holding a plan of Norfolk House), Music, Literature, Surveying and geometry. The large central panel represents a trophy of weapons, including the helmet and shield of Minerva, the Roman goddess of wisdom. Norfolk House was built between 1748 and 1752 by Matthew Brettingham (1699-1769), a Palladian architect, for Edward Howard, 9th Duke of Norfolk (1686-1777). Giovanni Battista Borra (1713-1770) designed the musical trophies: James Lovell (active 1752-1778) is thought to have executed those on the ceiling, as well as the chimney-piece, and Jean Antoine Cuenot (died 1763) is known to have carved those on the walls. 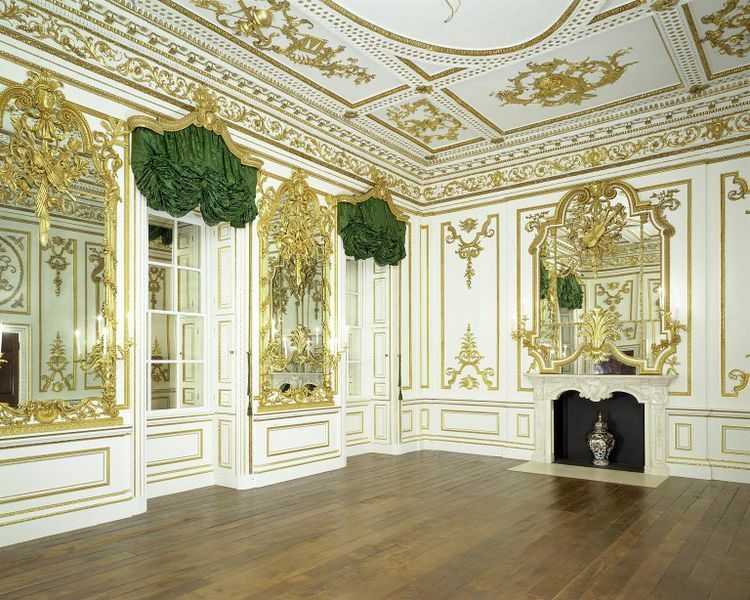 The exuberant style of the Music Room would have catered for the francophile tastes of Duchess Mary. Brettingham modelled the ceiling on that of the Banquetting Hall, Whitehall Palace, by Inigo Jones (1573-1652). Borra's designs for the trophies in the celing are similar to published engravings by Thomas Lightholer, whereas the masks on the walls are similar to engravings by Jean B‚rain (1639-1711), and the trophies to ones by Jean Fran‡ois Blondel (1705-1774). David Mlinaric, the interior decorator who worked on the room when it was re-erected in 2001, noticed that the design of the main mirrored panels was copied for the stall and first level of the auditorium of the Ivor Novello Theatre, Aldwych. This was shown in a short article on the theatre published in 'The Times' 12 December 2005 (page ref. not recorded). The theatre, first known as Waldorf Theatre, when it opened in 1905, was one of a pair of theatres flanking the Waldorf Hotel. It was designed by thetheatre architect W.G.R. Sprague (1863-1933). In 1911 it was re-named the Strand Theatre and in 1911 became the Whitney Theatre, reverting to the name The Strand in 1913. It was re-named the Novello Theatre in 2005. It was re-furbished in 1930, the early 1970s and in 2005. See Patrick Monahan, 'The theatrebuilder', and article on William Sprague, 'Country Life', 21 August 2013, vol. CCVII, no. 34, pp. 42-43. Medlam, Sarah, 'Declaring and Interest: the decoration of Norfolk House, London (1748-1856)', in Corrélations: les objets du décor au siècle des lumières. Etudes sur le 18e Siècle XVIII (2015), Editions de l'Université de Bruxelles, pp. 97-109. The idea of a circuit of rooms around a staircase was a new one for a London house, but it suited the large assemblies that were fashionable by the 1750s. London houses were generally much smaller than the private palaces of Rome or Vienna, but the large site on which Norfolk House was built allowed Brettingham to design more freely. The house provided a glittering setting for all sorts of entertainments, that reflected the dignity of the ancient family and its high standing in society. This plain scheme seems to have disappointed Brettingham's patrons, however, and they called in Giovanni Battista Borra in 1752 to enliven Brettingham's work. It was Borra who designed the carved enrichments of the upper walls, including the elaborate frames of the large mirrors and the rich trophies of musical instruments. He also designed the carved marble chimney-piece. A French-born craftsman working in London, John Antoine Cuenot (died 1763), carried out the carving of the wooden panellings, but we do not know who carved the marble chimney-piece. The plasterer Thomas Clark worked at Norfolk House 'according to Mr Bora's Directions', but there is no precise record of who designed and carried out the decorative plaster trophies on the ceiling. A full account of the conversation and redecoration of the room can be found in the second book in this room. The panelling is amongst the most elaborate ever carved for a London house. John Cuenot's bill, dated 24 February 1756, lists in detail what his carvers did, covering two and a half pages for this room alone. It accounts for everything from simple, running egg-and-dart to the mask heads at the top of the panels and the musical instruments. For the cornice alone he provided '11 different pattern mouldings'. The designer of the plaster trophies of the arts on the ceiling remains a mystery although it is clear that they were not by Thomas Clarke because in places they fit so awkwardly into his simple framework of mouldings.